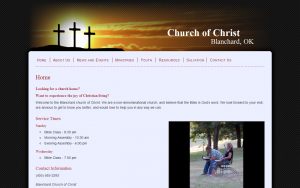 The Blanchard Church of Christ website has been in the works over the past few months. It is now ready for show time. The site went live a couple days ago. As of this writing I don’t think all the pages have content, but most of the main pages have at least some content. Another reason I am excited about the website is that it is a landmark in my web design career. This website is the first I have done on my own. Working on this project has given me a greater appreciation for everything else that goes on in the web design industry. In this project I got a small taste of everything from graphic design to meeting with the clients. It was a lot of work, but I enjoyed most of it. Please let me know if you encounter any bugs (I didn’t test it very well) or if it doesn’t work in your browser (I only tested in Firefox and Mobile Safari). Also, any suggestions or comments are also welcome. There are many calendars out there that list holidays. This is NOT supposed to be just another one of those. Yes, it does list holidays, but only the holidays that federal employees do not have to work. Also, many of the dates are different from the date that the holiday is celebrated. Any holiday that falls on a weekend will be listed on either a Friday or Monday, because that is the day that federal employees don’t have to work. The calendar can be subscribed to at webcal://www.littlefamily.us/calendars/federal_holidays.ics [See new link below]. I mainly developed the calendar for myself, so if you don’t like it don’t complain to me. The holidays are automatically downloaded and updated from http://www.opm.gov/Operating_Status_Schedules/fedhol/. Currently, it downloads five years on either side of the current year. However, this can easily be changed if someone has a need for it. If anyone has any comments or suggestions feel free to post them (that doesn’t mean I will have time to implement them). I just thought I would post the calendar here in case anybody wants it. Enjoy! Edit (8/16/2009): I had to change a few things due to a few clients (particularly Thunderbird/Lightning) downloading updates from the website every few minutes. I added HTTP caching (via the “Expire” and “ETag” headers) for a whole month to lighten up bandwidth usage. I also changed the calendar from 5 years before and after the current year to 1 year before and after the current year. If you have any problems with the calendar be sure and let me know, so I can get them fixed. This is the first official post on the Little Family Blog. This whole website started out as a just-for-fun project to see if I could set up a web server at home. I ended up setting up email, SSL, a blog, and a couple other things in addition to just a basic web server. It will be interesting to see where this project actually ends up. I hope Danie will end up using it to upload videos and pictures related to our family, but she may just stick to facebook. I may end up writing some posts, too. However, some of them may be strictly technical articles or how-to guides rather than family events.